Mature toddlers and children 3 years of age get to start our professional Fireflies® curriculum. In our preschool classes, students get to work with more detailed lesson plans than the Buttercups®. Teachers focus on allowing preschoolers to be more adventurous and creative, providing them with big-picture guidelines and constructive feedback. Mature Toddlers get regular diaper changes, and focus on life skills. These students learn to use “big kid” dishes and eat at the table, often family-style! Kids who are ready, are introduced to potty training, and are taught to wash up before and after meals, as well as after coming in from outside. Everyone learns to pick up after themselves when they’re done playing. This age group works with our professional Buttercup® Curriculum. 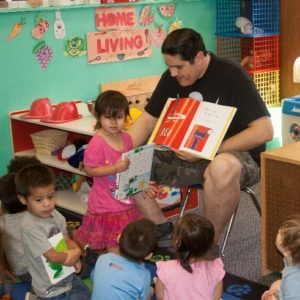 These specially-tailored lessons are designed for young children and include daily art projects, flash cards in English and Spanish, and singing songs. Toddlers get variety in the learning setting, alternating between circle time, table work, standing, and dancing. Click the button below to see more information about our professional curriculum. At 3 years old, preschool children switch to our professional Fireflies® Curriculum and spent a little more time on table-top activities than younger preschoolers do. This age group focuses on social skills and activities which build different areas of learning development, like puzzles, interactive games, dolls and “house” toys for role-playing, and blocks. The children also get time set aside for potty training throughout the day. Time to move around and be active is a principal part of all our classes. Contact Discovery World Learning Center Today! 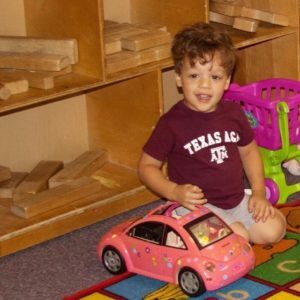 If you are looking for quality preschool education in San Antonio, visit Discovery World Learning Center. We have locations in Northeast, Northwest, and Downtown San Antonio. Contact us today for a tour of our facility, or to learn more about our toddler and preschool care. What Will Your Child Discover Today?